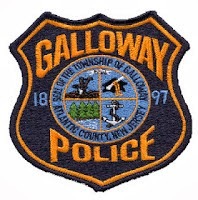 Galloway Township Police responded to 853 calls for service during March 24, 2014 through March 29, 2014. Additional statistics include: 3 Burglaries, 18 Motor Vehicle Accidents, 60 Tickets issued, 1 Driving While Intoxicated, 21 Arrests, 4 Domestic Violence,12 Fire Calls, 78 EMS Calls and 4 Juvenile calls. Edward Frost, 44 of Galloway was arrested for use of physical force or violence against the Law Enforcement Officer and Obstructing Administration of Law by Ofc Gorneau on March 24. Cynthia L Grohman, 22 of Hamilton Twp was arrested for shoplifting by Cpl McGinty on March 24. Carlton R Campbell, 62 of Egg Harbor City for Possession of less than 50 grams of marijuana by Ofc Kline on March 26. Troy S Bowser, 26 of Galloway was arrested for DWI and Obstructing Administration of law on March 26. Kimberly C Foley, 30 of Absecon was arrested for possession of CDS, possession of Hypodermic Needle, and Possession of Drug Paraphernalia by Ofc. Costa on March 27. Thelma C Johnson, 55 of Galloway was arrested for False Public Alarm by Ofc. Welsh on March 28. Franklin Lambert, 19 of NY, NY was arrested for Harboring/Concealing Another the Other by Ofc Glick on March 29. Kristin Moriaty, 20 of Unknown was arrested for Harboring/Concealing Another by Det. Casey on March 29. Alex Jean, 27 of NY, NY was arrested and charged with Resisting Arrest, Escape, and Criminal Mischief by Det. Casey on March 29. A 17 y/o male of Galloway was charged with Possession of less than 50 grams of marijuana and Possession of drug paraphernalia on March 26 by Ofc Abatemarco. A 17 y/o male of Galloway was charged with Possession of Drug Paraphernalia on March 26 by Ofc Abatemarco. A 16 y/o female of Galloway was charged with Possession of Drug Paraphernalia on March 26 by Ofc Abatemarco. A 16 y/o female of Absecon was charged with Possession of Drug Paraphernalia on March 26 by Ofc Abatemarco.